The fourth and final chapter of Elite Dangerous’ Beyond updates will launch December 11, and Frontier Developments says it’s the biggest update of the year. 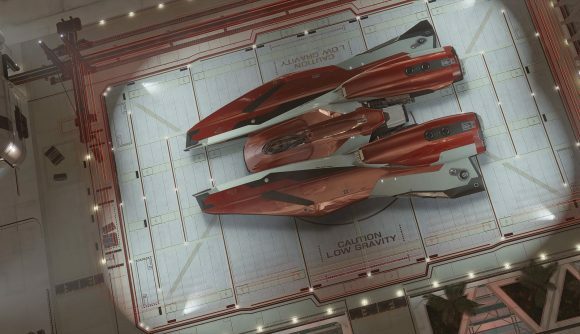 Chapter Four introduces two new ships to Elite Dangerous, the Mamba and the Krait Phantom. The Mamba is a slick, streamlined ship based on a racing prototype, and as such is one of the fastest spacecraft in the game. The Krait Phantom includes a wide selection of hard points, making it a very versatile choice for any number of roles. But that’s just the start of what Chapter Four is adding to Elite Dangeous. The update also adds a new Analysis Mode, which changes the way commanders explore the galaxy. It’s now a process of tuning scanners to lock onto celestial bodies and other ships, and it’s making the core of Elite Dangerous – flying around looking for stuff in space – a much richer experience. Speaking of richer, there’s also a brand new mining system coming with the update. You’ll have to learn the process of carefully firing mining probes into asteroids, working out where the sweet spot is for the best haul of delicious, valuable ore.
Jeremy has had a chance to check out some of the new features, and he says they bring “new life” to Elite’s inky black vacuum of interstellar space. Once it comes out, you’ll also be able to enjoy a reworked lighting system and a new squadron system for team communications. Not bad for a four-year-old game, right?